I was tagged by Karan to write this post. If there’s anything I’ve blogged about in graphic details over the last 2 odd months then its about my Blogging Goals. The idea of making 2016 an Year of me , with my vision board in place , I’ve even given the destination where I wish to reach a name , Digital Identity. Fancy right? Naah. Complicated is more like it. You know how things that are a notch beyond ordinary tend to go either brilliantly well or fall flat on their face . So this one brainwave needed a lot of nudge, shove, push in the direction that falls in the vicinity of ‘it works!’ over the past few months. Last Thursday , lost in thoughts , still mildly recovering from the huge hangover of the BlogChatter session previous night on Digital Identity , I was looking outside my window. And there it was , my Eureka moment. 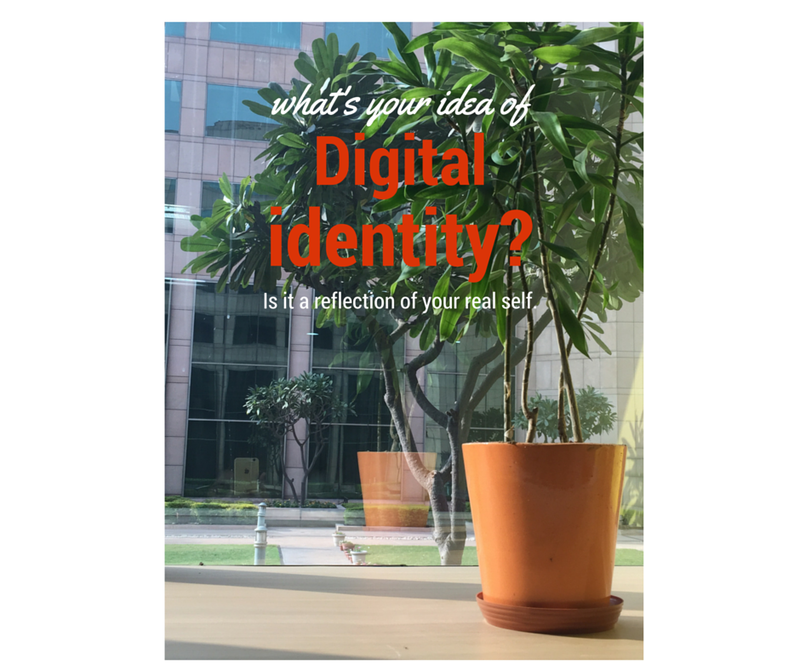 Digital Identity as an online reflection of the real me. The reason why I blog is for a sense of personal accomplishment. Not professional , not as a mother or wife . Every single achievement every single day in the real world is because I am playing a role . But this space reflects all that I am capable of me as a person. Committed to what I believe in to the extent of being obsessive . Proactive , Creative, Passionate, Loads of ideas yet believe in the power of execution. Ruthless on some days , Easy going on others [ Yup , balance – seeking balance all the time]. Always striving for simplicity and can literally stand on my head to make a good impression [ yet be very nonchalant about it]. Over the next few months , my online persona would be a mix of all the qualities I see in myself and translate them to my writing and engagement and take my Blog to the next level. Now that I am done with figuring out the broader canvas of Digital Identity , finding my voice is the next big step to paint a picture that’s worth a thousand words. I now tag Shalini to write her take on the topic. I want to take my blog to the next level with BlogChatter , the perfect companion on my journey to find my voice , my mojo and my Digital Identity. What’s your idea of taking your blog to the next level? Share your story , leave me a note? I like your concept of developing your brand. And though I haven’t really given it much though, I think your ideas are pretty much in sync with mine too – I’m hoping to make my blog and my writing style part of my brand identity. Good luck on your journey, Chandni. The thing you said about showcasing online identity as real world identity is a great idea. That’s how everyone should blog. When I read someone’s blog I want them to be in such a manner that they show me a part of their soul. Cheers to you!! Just “Blog on Regardless” – and your “Digital Identity” will automatically develop – of course – even your social media interactions will influence your digital identity.